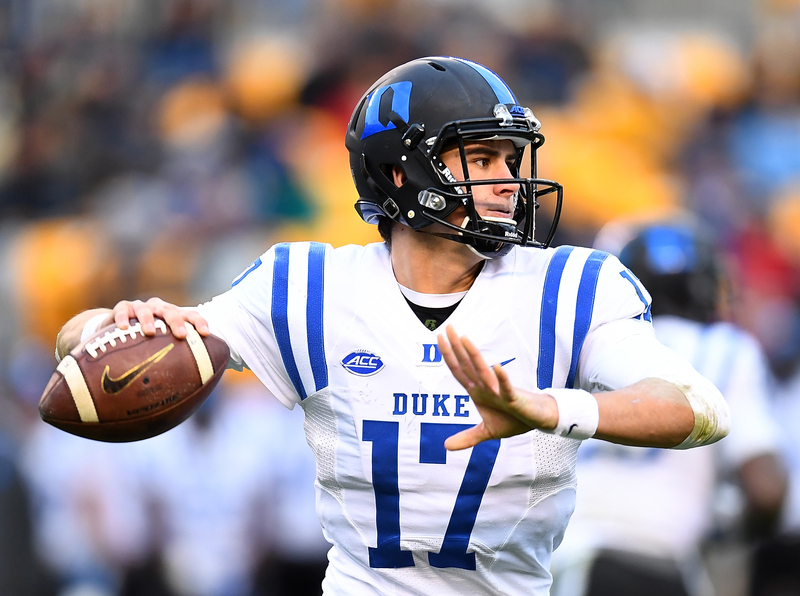 Duke’s quick start, one of the Blue Devils weren’t shy about anticipating in fall camp, suddenly struck three injury speed bumps following impressive season-opening victories over a pair of 10-win teams, Army and Northwestern. The school announced on Sunday that All-ACC cornerback Mark Gilbert is lost for the season with a hip injury and third-year starting quarterback Daniel Jones is out indefinitely with a left (non-throwing side) fractured clavicle. Both players were hurt in Saturday’s 21-7 win at Northwestern; they underwent surgery Sunday upon the team returning home from Evanston, Ill. In addition, the Blue Devils played Northwestern without wide receiver Aaron Young, who suffered a hamstring injury earlier in the week in practice. Young had led Duke in receiving in the win over Army with four catches for 114 yards and a touchdown. Fractured bones typically take four to six weeks to heal. Duke has games the next three Saturdays at Baylor, at home against North Carolina Central and at home in their ACC opener against Virginia Tech before a bye the fourth week on Oct. 6. The season resumes on the fifth and sixth weeks since the injury on Oct. 13 at Georgia Tech and Oct. 20 at home against Virginia. At Northwestern, Jones threw three touchdown passes in the second quarter to rally Duke from a 7-0 before he was injured on a third-quarter sack. His scoring tosses were to T.J. Rahming for 9 yards, Johnathan Lloyd for 52 and tight end Davis Koppenhaver for 7 in stride as he ran out of the back of the end zone. Jones finished 16-of-22 for 192 yards and three touchdowns without an interception. Through two games the NFL prospect is 29-of-39 (74.4 percent) for 389 yards and four touchdowns without an interception. Redshirt junior Quentin Harris replaced Jones and finished the game 2-of-2 passing for 12 yards with five carries for 27 yards. Harris doesn’t have Jones’ NFL arm, but he is a strong runner; that likely means adjustments to Duke’s offensive game plans. The other backups are redshirt freshman Chris Katrenick and true freshman Gunnar Holmberg. Only Harris has taken snaps among the three backups. Gilbert, who is projected as high as the NFL’s first round following an All-ACC sophomore season, was replaced by a combination of Michael Carter III and Josh Blackwell. They had been splitting time at the corner spot opposite Gilbert. At Northwestern, Carter recorded eight tackles and an interception and Blackwell four tackles. Northwestern quarterbacks Clayton Thorsen and T.J. Green, while playing the second half from behind, combined to average only 5.0 yards per attempt and 9.1 per completion. They were 31-of-56 passes for 282 yards without a touchdown and two interceptions. -- Book on Michigan State's leading role in the integration of college football. It explains Duffy Daugherty's untold pioneering role and debunks myths that steered recognition away from him to Bear Bryant. Tom Shanahan is an award-winning sportswriter and the author of "Raye of Light". Tom spent the bulk of his career in San DIego writing for the San Diego Union-Tribune. He has covered NCAA Tournaments, Super Bowls, Rose Bowls, the NBA Finals and the World Series in a career that included writing for Voice of San Diego, the San Diego Hall of Champions and Chargers.com. He contributes to the Detroit Free Press, Raleigh News & Observer, MLB.com, Rivals.com and the National Football Foundation's Football Matters. He won multiple first-place awards from the San Diego Press Club and first place from the Copley News Service Ring of Truth Awards. The National Football Foundation/San Diego Chapter presented him its Distinguished American Award in 2003. USA Track and Field’s San Diego Chapter presented its President’s Award in 2000. Raye of Light: Jimmy Raye, Duffy Daugherty, the integration of college football and the 1965-66 Michigan State Spartans. It explains Duffy Daugherty's pioneering role and debunks myths that steered recognition away from him to Bear Bryant. David Maraniss, Pulitzer Prize winner and biographer: "History writes people out of the story. It's our job to write them back in." EXCEPT WITH THE PRIOR WRITTEN PERMISSION OF Shanahan Report.